For many years, the raised flowerbeds outside the Health Centre in Enmore Road were empty and unattractive. In March 2016, NHS Property Services and Croydon Council agreed to allow People for Portland Road to take over the maintenance of the beds facing Enmore Road, and the Portland Road Community Garden was born. 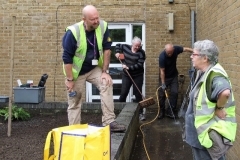 A plan was drawn up and work began with delivery of 20 bulk bags of soil to top up the beds. This was a scary-looking quantity, but lots of local people turned up to help at the ‘Big Dig’ we held one Saturday morning in July, and all the soil was distributed between the beds. Thanks to a donation from the local council we were able to buy some trees, ferns and shade-loving shrubs. 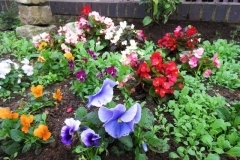 Our volunteers planted these out, along with pansies and geraniums, topped up in October by 400 bulbs to provide spring colour. We also scattered liberally – a little too liberally, it turned out from the amount we had to thin out the following spring – poppy seeds we had saved from the Health Centre bed in Denmark Road. 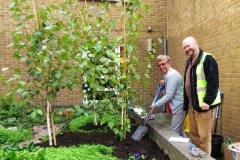 We are grateful to the Country Park Practice for supplying us with three silver birch trees, and to the health centre colleagues who gave us other seeds. And many of our volunteers have contributed seedlings and plants as well as their valuable time and effort. 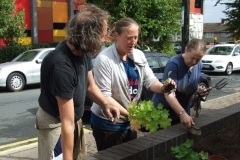 The next phase was to draw up a plan to extend the Portland Road Community Garden to the area outside the South Norwood Leisure Centre, where a community noticeboard had already been installed. 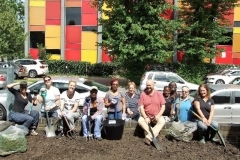 Croydon Council gave this the go-ahead in March 2017 and we started by installing a stage area and benches, then planting shrubs and barrels of herbs. ‘What is the stage for?’ people often ask. Our answer is usually: ‘Anything you want to use it for.’ We’ve already seen children dancing on it, but there is plenty of scope for other performances. South Norwood Country Park helped us collect logs to form bug piles, and we have been able to use old coping stones from Blackhorse Road Bridge and kerbstones left over from the building of Oasis Academy Arena School to create features and borders. This green area has helped to generate community interaction, as well as providing a place for people to relax together. Many residents have given us plants from their allotments and gardens, and in exchange we’ve been able to give them seeds or just a scoop of compost. We have created a list of local people interested in helping to maintain garden or to lead new gardening projects. If you would like to get involved, please email us or phone 07982 444773. It is great to see and hear the interest and pleasure that has been created by the garden, which now spans two sides of Enmore Road, and we’ve had some great comments.